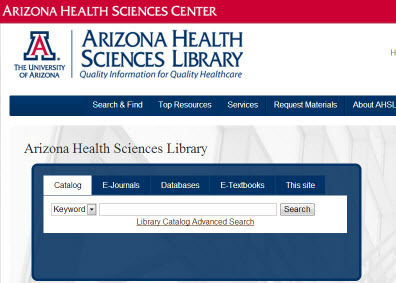 Click the blue tabs on the left to learn what the University of Arizona Health Sciences Library (UAHSL) has to offer for both undergraduate & graduate nursing students & faculty. As a UA nursing student you have unrestricted access to all resources from the AHSL website. When you are off-campus you are prompted to authenticate with your NetID and password. For a quick start, go to this page. If you are unable to authenticate or need any assistance with literature searches or library resources, please contact Maribeth, the nursing librarian, for assistance.